EIGHTY-EIGHT STUDENTS and faculty members attached to the Dominica campus of All Saints University College of Medicine returned to that country Wednesday, after spending close to six months at the university’s campus here. The group, which left onboard the vessel L’Express Des Iles, was part of a larger group that came to these shores last September after the devastation of Dominica by Hurricane Maria. On Wednesday, Luis deShong, principal assistant registrar at All Saints University in St Vincent and the Grenadines (SVG) said the University was able to fully accommodate the students and faculty who came here. He said while some have decided to return to Dominica, others have opted to stay in SVG to continue their education. deShong said that 88 people returned to Dominica onboard the ferry, but 11 others opted to go by air. Over 400 students came to SVG last year after the hurricane and according to deShong, some of those who came in September and October left prior to last Wednesday, as they were doing their clinical rotations and decided to go on to the United States, back to Nigeria, to the United Kingdom (UK) or Canada to continue and complete their studies, which is not unusual. deShong said the students were given the option to stay here, or go back to Dominica, but the remaining persons at the clinical level and those doing their rotations have stayed. “We took the policy decision that those at the MD5 and MD4 levels, nearing the end, they should stay to continue their work for now and I don’t know if they would continue that. Some students at the pre-med levels 1,2,3,4 and MD1,2,3, have opted to stay, and they have begun the entire process of getting a transfer to the SVG campus,” explained deShong. The principal assistant registrar also noted that while the students, most of them Nigerians, were here, adjustments had to be made at the campus as it relates to classroom space. He added also that initially, it was a stretch to get housing for everybody, and as a result, some students were housed at hotels, but later moved to more permanent accommodation. “They were into everything, social life, but they focused on their studies,” said deShong who noted that some of the students who came across had lost everything in the hurricane and had to start over. Last September, SVG also welcomed 70 students from the Dominica campus of St James University who continued their education at the SVG campus of the University at Arnos Vale. 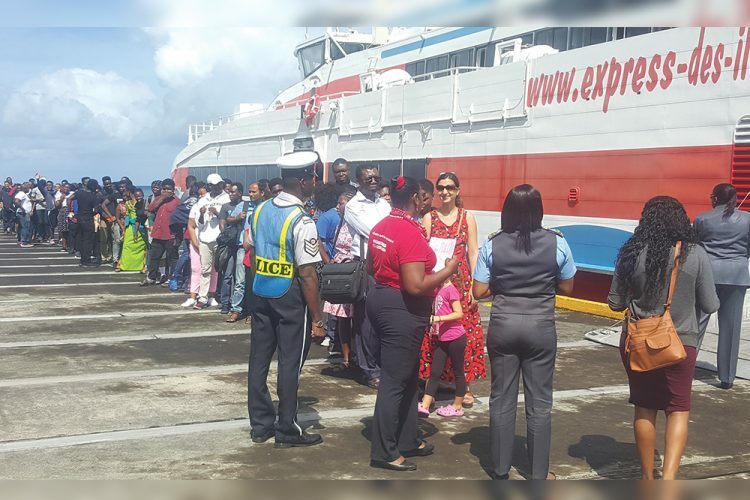 MEDICAL STUDENTS and faculty from the Dominica campus of the All Saints University College of Medicine, who transferred here after the passage of Hurricane Maria last September, line up to board the L’Express Des Iles.